McKinsey & Co. released its annual review “North American asset management in 2018: The New Great Game” on November 15, 2018, and in pointing out that the industry is undergoing a major shift, the report’s primary message is that the gap between the best and worst asset managers continues to widen. Interestingly, it appears the growth gap favored the very large ($1 trillion or more in AUM) and the very small (less than $50 billion in AUM). While the past eight years have been overall positive for the asset management industry – though active equities have endured more hardships than other asset managers, through larger fee compressions and dropping margins – the report suggests that there are some worrisome issues that are bubbling under the surface when it comes to the widening growth gap. To accomplish point three, the McKinsey report says that firms need to take advantage of new data sources and technology, which can lead to vast improvements in effectiveness and efficiency. "Unbundling of research costs has catalyzed a re-think by leading asset managers concerning how they get their insights now that broker-provided research and corporate access is no longer 'free.' This is precipitating three major shifts: first, a reshuffling of research relationships, in some cases in favor of smaller, specialized research providers; second, more centralized management of hard-dollar research budgets; and third, a move on the part of the very largest managers to consider bringing additional elements of investment research in-house, where they could share advantages of scale." Let’s consider each of these three shifts. With more firms creating hard-dollar research budgets due to unbundling requirements, firms are increasingly managing not only research budgets but research relationships at the firm level, rather than at the individual level. According to the report, “It’s prompting a re-mapping of ‘sources of insight’ through an expansion of the set of of external parties (including fintech and non-traditional data firms) with which asset managers need to establish and maintain relationships.” At Visible Alpha, in order to avoid inducements from MiFID II, we've seen some firms put controls in place to restrict access to certain research providers across all content sets (research, models and events), while others – particularly those not directly impacted by the regulations – continue to allow access to all providers in the pursuit of alpha. Even in the first half of 2018 it became clear that some larger firms were starting to bring more research in house and in turn drive cost efficiencies. The report goes on to suggest that there are three essentials for asset managers in this changing environment. One such imperative is putting the client at the center: “client-centricity.” Firms need to determine how to provide an full end-to-end client experience and deliver the value that will retain clients. Institutional clients are increasingly moving toward fewer but more strategic relationships. This means asset managers may experience fewer clients but that those clients will be allocating more assets to each asset manager. In turn, retention and client satisfaction becomes increasingly important. Firms will need to put a greater focus on providing true value to their clients. We believe that technology, data and analytics will help firms rise to the top. 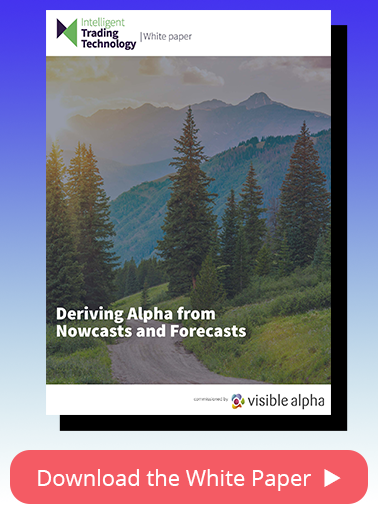 By increasing investment professionals’ efficiency and offering new data sets and insights, Visible Alpha can empower institutional investors to find their competitive edge.